NEW YORK (CNNMoney) -- Apple's stock market value topped the $500 billion mark in early trading Wednesday, another record high for what was already the world's most valuable company. The half-trillion dollar valuation puts Apple in some extremely exclusive territory, making it one of the five most-valuable companies at any point in history. Only Microsoft, ExxonMobil, Cisco (CSCO, Fortune 500), General Electric (GE, Fortune 500) and Intel (INTC, Fortune 500) have ever surpassed that mark. Exxon did it most recently in late 2007, when oil prices were soaring. Microsoft, Cisco and GE reached half a trillion dollars in market capitalization in 1999 during the height of the tech bubble. Microsoft was the only company ever to have a valuation of $600 billion. Its market cap now sits about $267 billion. Despite its size, Apple is still one of the fastest growing technology companies. The company reported in January that its sales grew 73% last year. It also posted the second-most profitable quarter in history for a U.S. company. The stock has been soaring for the past three years. Apple (AAPL, Fortune 500) shares reached $500 for the first time two weeks ago, setting yet another high-water mark for the tech giant. The company's market cap first topped the $500 billion mark in after-hours trading Tuesday as Apple's stock rose to $537.54 a share. It was up even more in morning trading Wednesday, hitting an all-time high above $540 a share. It was only a month ago that Apple's market valuation rose to $400 billion for the first time. On Jan. 25, it passed ExxonMobil (XOM, Fortune 500) as the most valuable company on the stock market. Exxon now has the second-highest valuation at about $410 billion. PetroChina (PTR) is third at $281 billion, followed by Microsoft (MSFT, Fortune 500). Despite Apple's stunning rise in share price, the company's stock gains haven't even kept pace with its earnings. That means Apple's shares are relatively cheap. 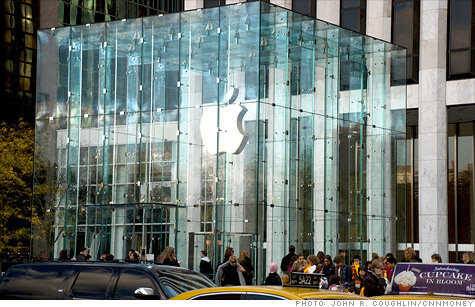 The tech giant's stock trades at less than 13 times its expected earnings for 2012. That makes it cheaper than the tech-heavy Nasdaq 100, which trades at about 18 times forecast earnings. And Apple is wildly cheaper than some of the other tech companies out there with far less predictable futures, like Netflix (NFLX), Zynga (ZNGA), LinkedIn (LNKD) and the soon-to-be public Facebook. Apple had $127.8 billion in sales during the 2011 calendar year, putting it neck-and-neck with Hewlett-Packard (HPQ, Fortune 500), the nation's largest tech company by revenue. This year, Apple is on pace to become the biggest technology company in the world, measured by revenue, outpacing current global No. 1 Samsung. That's a pretty stunning achievement for a 35-year old company that had a market cap of just $10 billion a decade ago.